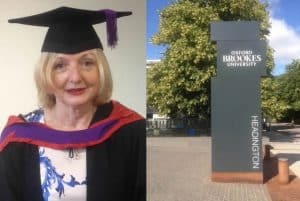 OBU – Oxford Brookes University BSc Honours in Applied Accounting. What is the OBU all about? This is a unique programme designed by ACCA in conjunction with Oxford Brookes University intended to ensure that all students registering with ACCA have the opportunity to acquire not just the ACCA accounting qualification but also a university bachelor degree. Below you will find a brief overview of the OBU programme which summarises the main initial aspects of the Oxford Brookes University BSc Honours in Applied Accounting. OBU Period 37 Results – Delayed! Although the Information Pack states the Period 37 results will be out on 20 March all students who submitted should have received an email notifying them that because of all of the technical problems surrounding Period 37 submissions and the late admission of work, their release has been postponed. Results are now expected to come out on 17th May and unlike in previous periods will NOT be available by logging on to the submission portal. Instead you will be contacted and given your result by email notification. If you are hoping to submit in Period 37 (1 – 15 November 2018) then you need to be eligible. If you have any queries about eligibility contact acca@brookes.ac.uk sooner rather than later as deadlines will not be extended. Submission fee is GBP 340 (an increase since 2017). Work will not be marked unless the full submission fee has been paid. Why not develop your skills further and increase your career opportunities? Most UK university bachelor degrees take 3 years to complete but by joining forces, the ACCA and OBU present a ‘fast-track’ way of getting those all important BSc letters after your name, but without any real short-cuts! While you have been toiling over all of your ACCA exams you have been demonstrating technical accounting skills – just like students on Accounting and Finance courses offered by other Universities. 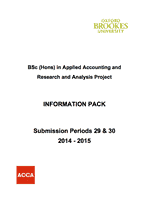 OBU has produced an OBU RAP Information Pack, it contains a mixture of information relating to many of the rules on how your RAP grade will impact on the classification of the honours degree if you pass, the timetable for submission, various checklists, the current submission fee, but most importantly in the Appendices (currently Appendix 1) you will find the Assessment Criteria. Download OBU Information Pack to find out all the OBU requirements and gives a lot of advice to get you started. This is a formal 7,500 word report on one of 20 set subjects. In addition to the Research & Analysis report you must also submit a 2,000 word (approx.) Skills and Learning Statement and Presentation slides at the same time. In order to produce a successful RAP you have to evaluate and / or analyse information from a range of sources. This means creating some meaning of what you have found, or making a judgment or coming to a conclusion. If you only report the information that you have found or generated, you will not pass the RAP. The ability to evaluate and / or analyse information is a very important graduate attribute and the grade that you are awarded for your RAP will be significantly influenced by ‘how well’ you demonstrate your evaluative and/or analytical skills in your RAP. Referencing (along with Evaluation and Analysis) remains the most common reason for failure of first submissions. This is particularly frustrating for a student when they have otherwise done a very good RAP as it means that any resubmission can only ever achieve a C grade. Part 1, is background information about why there is the emphasis on referencing in the first place, which then helps you appreciate Part 2 which sets out the Golden Rules. Part 3 answers some frequently asked questions. The last of these questions, Q10, contains a lot of useful links to websites where you will find more details of how to deal with particular types of references (it would be impossible to outline all of these in one article). However if you explore the links you will find that with some of them you can enter the type of reference you are having a problem with and it will show you how to deal with it. In order to complete your RAP you will need to have a project mentor. The mentor should be someone whom you feel is the right person to help guide you through the RAP process. There are 2 opportunities per year to submit your work: May and November. The project must be submitted online at the Oxford Brookes University submission portal website by the date of latest submission. The Academic Conduct Office (ACO) is the OBU department that deals with any potential infringements of the University rules or regulations. It exists to maintain the integrity of the University’s degree system and to ensure that all students comply with the expected standards of academic behaviour demanded of a UK university. Although failing the RAP or SLS (either the written part or the Presentation) first time will obviously be a disappointment, you will have 2 further attempts to make good any deficiencies. Only on OpenTuition you can find expert and free advice from people who really know about the OBU RAP. If you have a query or a useful comment then you can post this to the appropriate forum and share it with others. 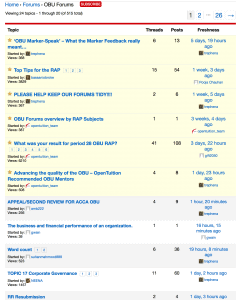 Visit also OBU Forums for expert advice from contributors who have had years of experience in helping students prepare for their RAP submission and in some cases contributors who themselves have gained their degree by going through the OBU RAP process.